Last week we created our own reversible cup cozy. 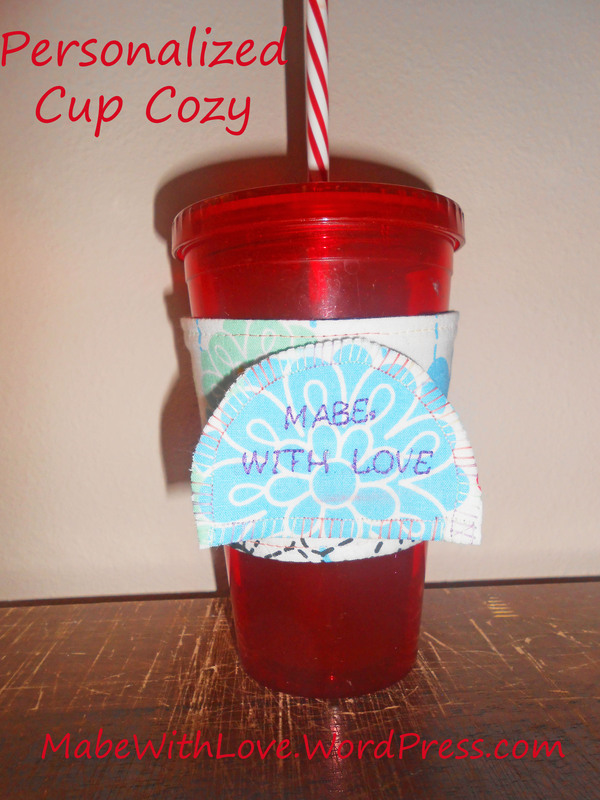 This week, we’ll learn how to embellish that same cup cozy to make even more personalized. The embellishment will be done with removable discs so that you can change the look of your cozy to suite your mood. Fabric. You can use a fabric that coordinates with the fabric we used for the cozy body or the same fabric. Sewable, fusible stabilizer. I use Heat N Bond Lite sewable. 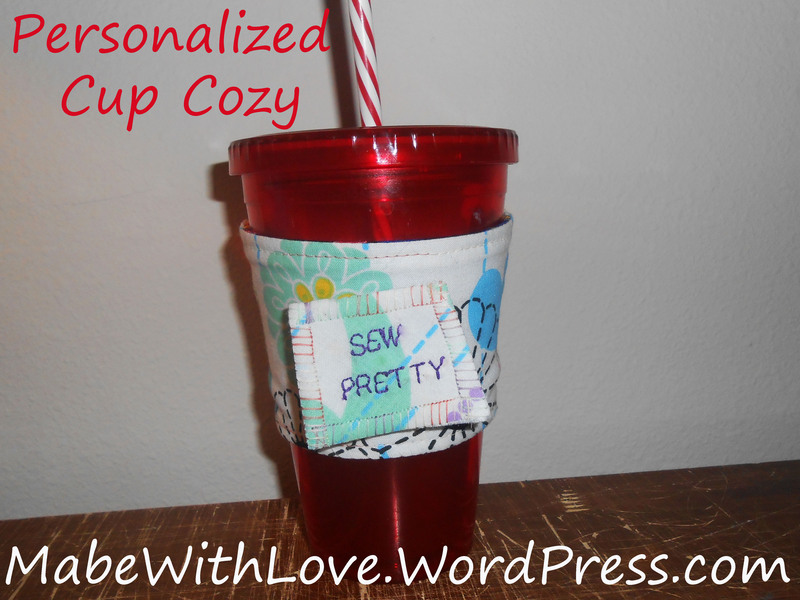 The illustrated and detailed Personalized Cup Cozy PDF: Personalized Cup Cozy. This week’s sewing tutorial is simple and quick. You won’t even need a pattern (although we’ve provided some for convenience)! Play food is a great beginner’s sewing project and can be altered to make food as simple or as fancy as you’d like. These festive Valentine’s Day chocolates and cookies are fantastic as decor, playing, and a learning tool. You can embroider or draw (with puff paint or fabric paint) letters and numbers on them. You can use them to teach colors, shapes, or even as coins. You are only limited by your creativity. 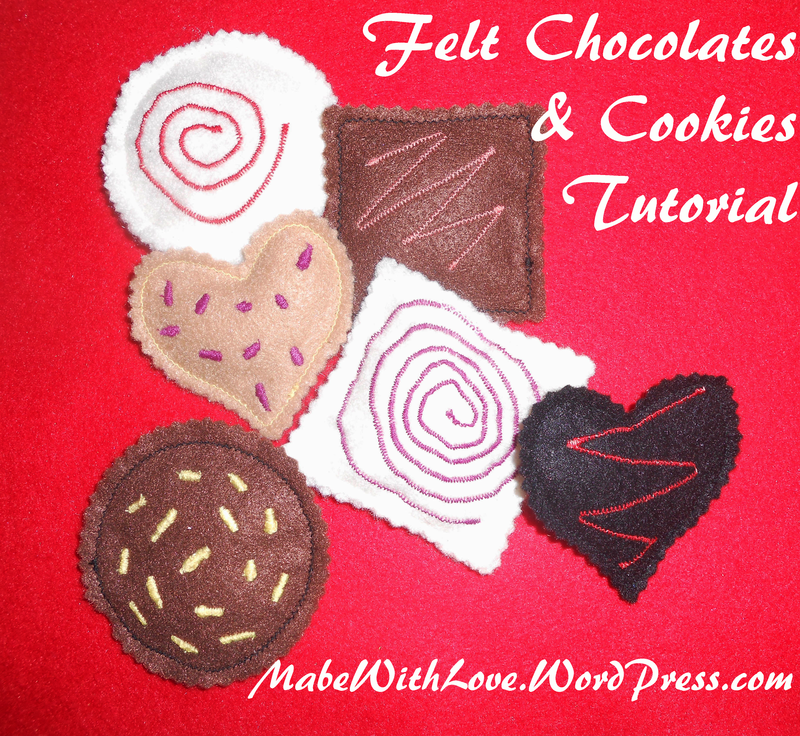 This tutorial will focus on creating the chocolates and cookies with a sewing machine, but you could also hand sew the items. If you don’t sew, you could use felt fabric glue to glue the pieces together. When making felt foods please keep the age of the child you’re making the project for in mind. Children who still put things in their mouth should never be given small objects as these would pose a choking hazard. They also should not be given items with puff paint as they could pick the paint off. When making felt food you can use whatever type of felt you desire. Craft felt is easy to work with, cheap and easily obtainable but it will not wear as well as wool felt. Craft felt may get pilly over time, but you can wash it with warm soapy water and use a lint shaver to get rid of pills. If the item doesn’t contain a pipe cleaner or glue, you could even run it through the washing machine. Wool felt will wear better and last longer. If you’re creating something that you’d like to pass down from child to child, wool felt is best. If you plan to use wool felt, you may want to first practice on craft felt so you don’t waste money on the more expensive stuff. I typically use eco-fi felt which is made of recycled plastic bottles. Start out by placing two pieces of felt wrong sides together and cutting out your desired shape. You can freehand this or use one of the templates we’ve provided above. You can use any size circle you like. If you’re going to sew a plain piece of chocolate or cookie and don’t want to add any other design, then you’re ready to sew, go ahead to step 3! If you want to add a design, go on to the next step. Once your chocolate or cookie is cut out, you can add a design to the cookie. Sometimes I like to add swirls, sprinkles, or just a whimsical design. Take one side of the chocolate or cookie and add your design. You can put the same design on the other side, or do something different so you get more ‘activities’ or designs in one cookie.You could do numbers and letters to teach the alphabet or counting. You could do sprinkles, colors, shapes, etc. You really are only limited to your imagination with these and kids love to get in on the design. Once you’ve added a design to both sides, pin the cookie together, right sides both facing out.We’ll sew the cookie together using an overcast stitch. If you don’t have an overcast stitch on your machine, a wide zig zag stitch works great. Since the edges of the felt won’t fray, you could even use a straight stitch. If using an overcast stitch, make sure your right hand side stitch falls just over the edge of the cookie. You might need to sew a stitch and then adjust your cookie’s placement under the presser foot to get it just right. Sew all the way around the outer edge of the cookie making sure you back-stitch/reinforcement stitch at the beginning and end. IF YOU’RE STUFFING YOUR CHOCOLATE OR COOKIE PIECES, STOP SEWING WHEN YOU HAVE ABOUT 3/4 -1″ LEFT TO GO AND STUFF A SMALL AMOUNT OF POLYFIL INTO YOUR PIECE WITH THE EDGE OF YOUR SCISSORS OR A SKEWER. ONCE YOU HAVE IT STUFFED, CONTINUE SEWING AROUND THE OUTER EDGE UNTIL YOU’RE BACK AT THE BEGINNING. Clip your threads when you’re done. That’s it! Easy peasy. You can make as many of these as you can crank out. They make lovely gifts and are great to have for any home school or home learning lesson plans. 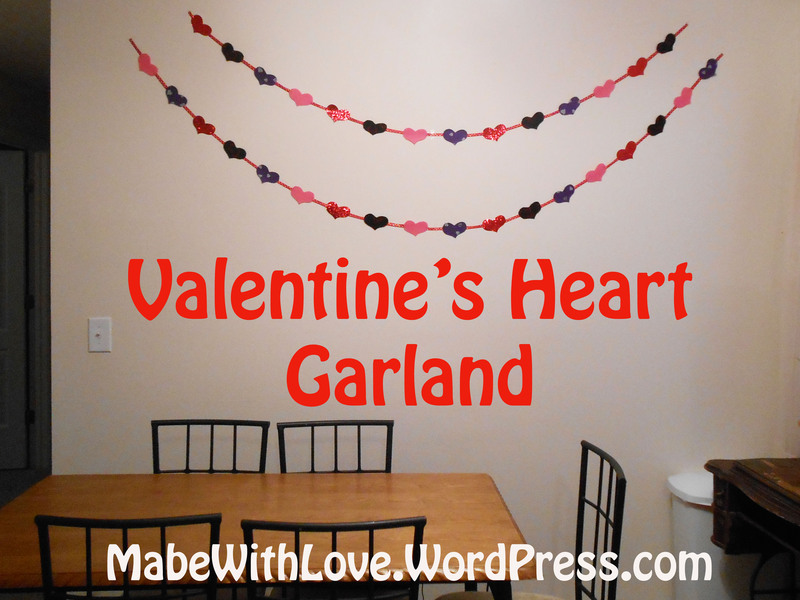 I love the look of festive garland for all holidays, Valentine’s Day being no exception. This colorful, fun garland is easy to create and highly customizable. For the garland created in this tutorial, we will be using felt and/or vinyl sheets and ribbon. You could also create the garland with card stock and twine if you’re not a sewer. Felt, stiffened felt, and/or glitter vinyl sheets. I like to use the 9X12 sheets you can buy at craft stores. I’ve used four sheets for the garland featured. One piece of stiffened felt, two pieces of regular eco-fi felt, and one piece of glitter vinyl. *Optional – Cricut or other paper cutting machine to cut out hearts. You certainly don’t have to use a Cricut, you can easily cut the hearts out by hand. If cutting by hand you can use one of the heart templates provided in the tutorial. 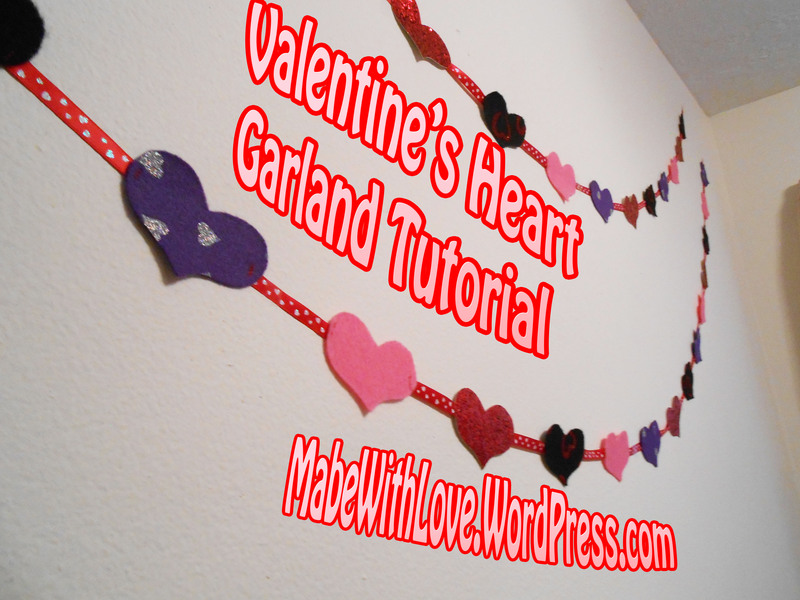 The detailed and illustrated tutorial provided here: Valentine’s Heart Garland. I’m an organized person. I like for things to be tidy and have their place. With two kids, and an addictive passion for sewing, I have a lot of small items in my home. Things we use A LOT. I like to find ways to organize all our ‘stuff’ that is still easy for us to access. These handy little hanging organizers work nicely for that. The organizers are very inexpensive to make (you can make one for less than $1) and super quick to sew up (twenty minutes or less). You can easily customize the fabric print to suit any style and you can change the type of fabric to make them more or less sturdy depending on your needs. Two pieces of fabric in your preferred sizes. 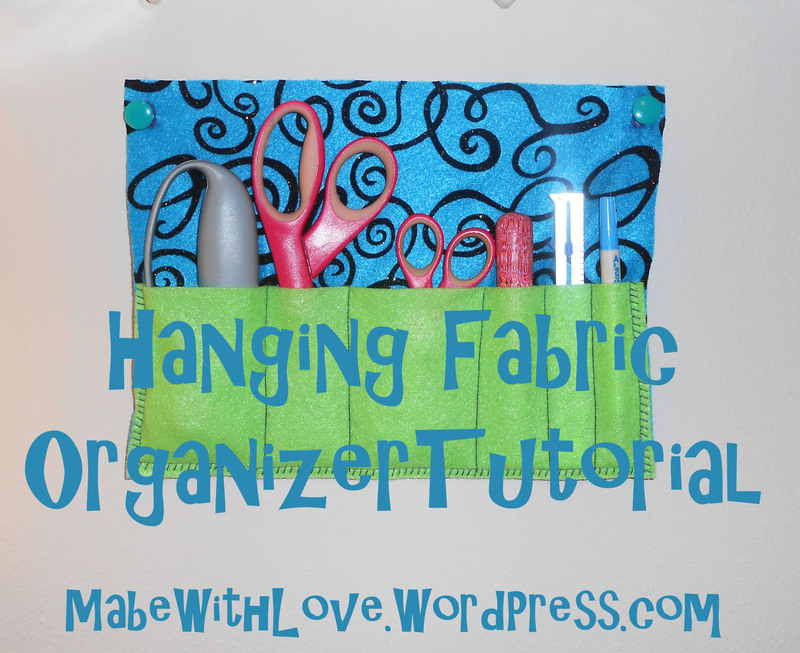 The organizers featured in this tutorial are made with two sheets of felt. The organizer body piece is approximately 9X12 and the divider piece is approximately 4.5X12. You can use whatever sizes suit your needs. It’s important to select a fabric strong enough to support your needs. For lightweight items, I like to use felt because it’s inexpensive and it doesn’t fray even when cut. If you’re using cotton or another fabric that frays, you will need to bind the edges or you will get fraying. **This tutorial is provided free of charge, you may do what you wish with the finished project. We ask that you DO NOT try and sell the tutorial. Welcome! Today we’re going to make a big mug of hot cocoa that even little ones can enjoy! Play food is a great beginner’s sewing project and can be altered to make food as simple or as fancy as you’d like. This tutorial will focus on creating the set with a sewing machine, but you could also hand sew the items. If you don’t sew, you could use felt fabric glue to glue the pieces together. When making felt foods please keep the age of the child you’re making the project for in mind. Children who still put things in their mouth should never be given small objects as these would pose a choking hazard. When making felt food you can use whatever type of felt you desire. Craft felt is easy to work with, cheap and easily obtainable but it will not wear as well as wool felt. Craft felt may get pilly over time, but you can wash it with warm soapy water and use a lint shaver to get rid of pills. If the item doesn’t contain a pipe cleaner or glue, you could even run it through the washing machine. Wool felt will wear better and last longer. If you’re creating something that you’d like to pass down from child to child, wool felt is best. If you plan to use wool felt, you may want to first practice on craft felt so you don’t waste money on the more expensive stuff. I typically use eco-fi felt which is made of recycled plastic bottles. Felt in red (or a color of your choosing) for the mug, brown, tan, and white. 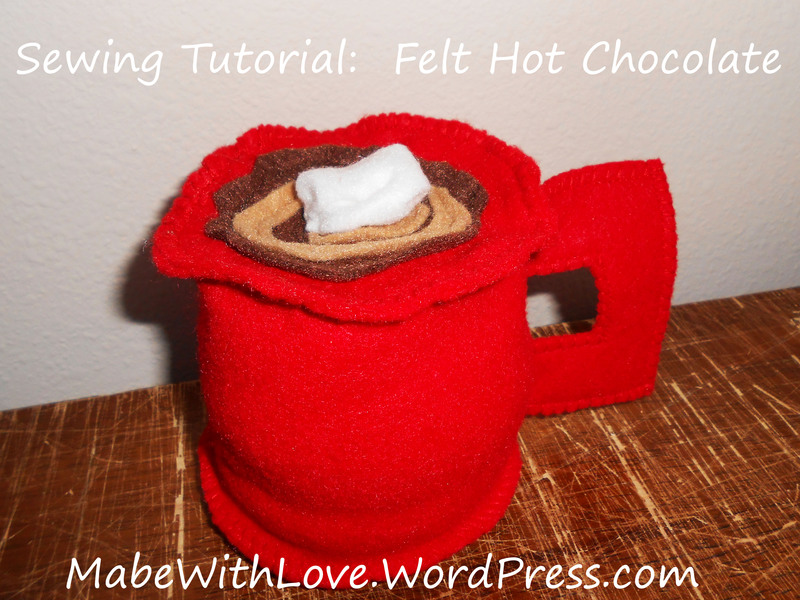 The hot chocolate mug template and fully illustrated sewing tutorial. Do not scale the file to fit, print as actual size: Felt Hot Chocolate. 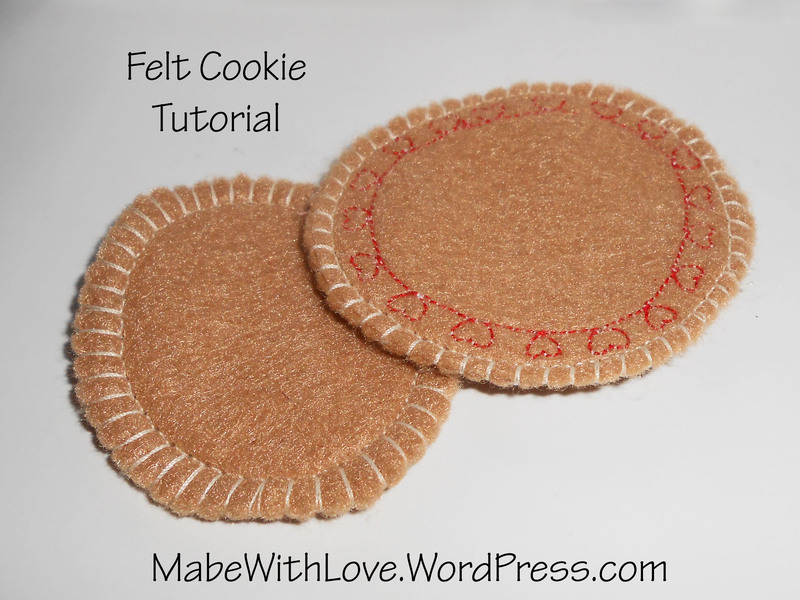 This sewing project pairs nicely with our easy peasy felt cookies. And it’s one set of cocoa and cookies that Santa is sure to love! This week’s sewing tutorial is super simple and super quick. You won’t even need a pattern! Play food is a great beginner’s sewing project and can be altered to make food as simple or as fancy as you’d like. These cookies are fantastic as a learning tool. You can embroidery or draw (with puff paint or fabric paint) letters and numbers on them. You can use them to teach colors, shapes, or even as coins. You are only limited by your creativity. This tutorial will focus on creating the cookies with a sewing machine, but you could also hand sew the items. 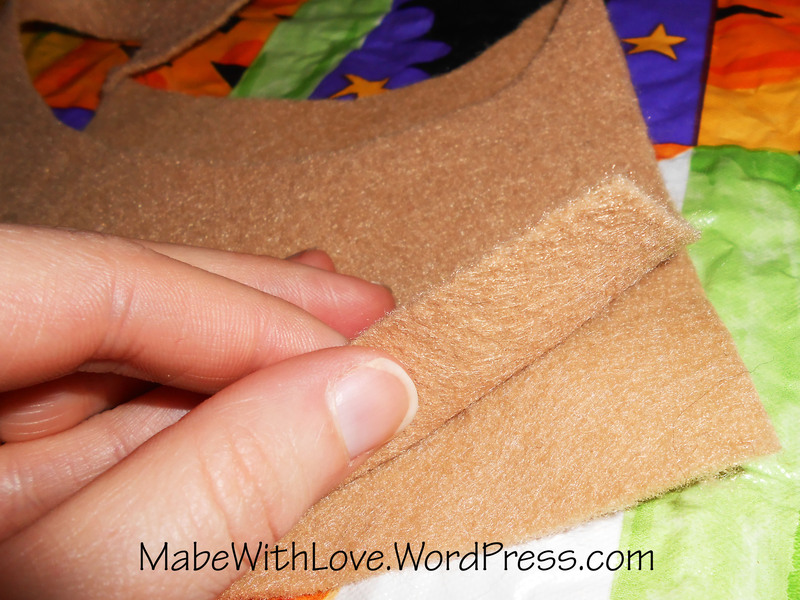 If you don’t sew, you could use felt fabric glue to glue the pieces together. When making felt foods please keep the age of the child you’re making the project for in mind. Children who still put things in their mouth should never be given small objects as these would pose a choking hazard. They also should not be given items with puff paint as they could pick the paint off. 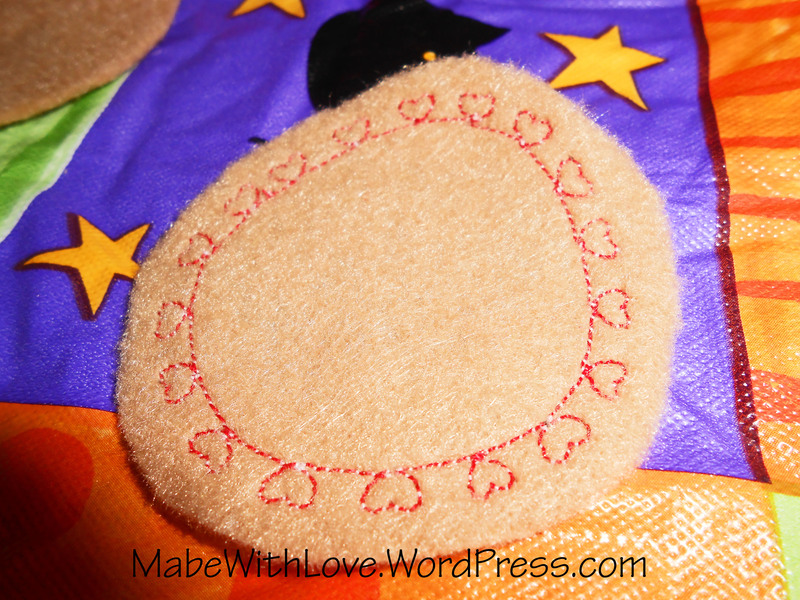 Start out by placing two pieces of felt wrong sides together and cutting out a circle. You can use any size circle you like, freehand it or trace a cup, etc. If you’re going to sew a plain cookie and don’t want to add any other design, then you’re ready to sew, go ahead to step 3! If you want to add a design, go on to the next step. Once your cookie is cut out, you can add a design to the cookie. Sometimes I like to add dainty stitches like the heart design pictured. Take one side of the cookie and add your design. You can put the same design on the other side, or do something different so you get more ‘activities’ or designs in one cookie.You could do numbers and letters to teach the alphabet or counting. You could do sprinkles, colors, shapes, etc. You really are only limited to your imagination with these and kids love to get in on the design. If using an overcast stitch, make sure your right hand side stitch falls just over the edge of the cookie. 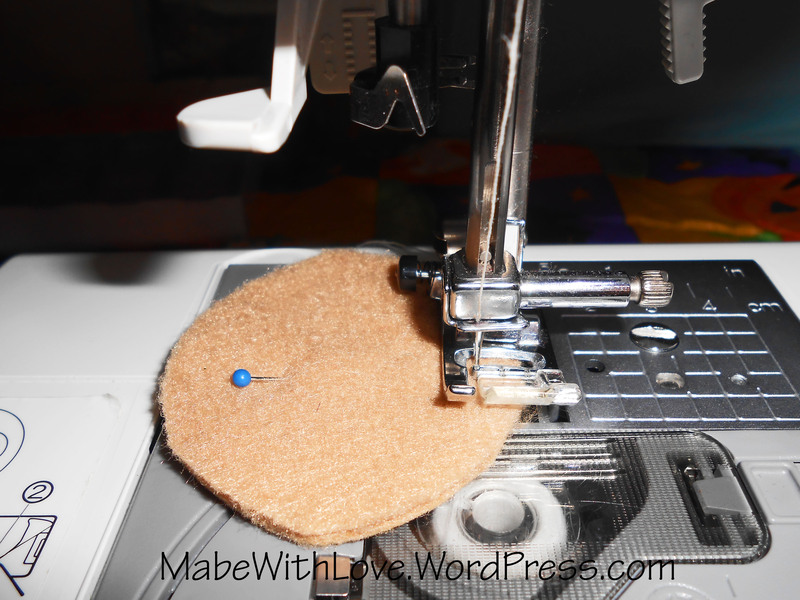 You might need to sew a stitch and then adjust your cookie’s placement under the presser foot to get it just right. Sew all the way around the outer edge of the cookie making sure you back-stitch/reinforcement stitch at the beginning and end. Clip your threads when you’re done. Welcome! This is the second and final sewing tutorial in a two-part series where we will make a felt Steak Dinner set. Play food is a great beginner’s sewing project and can be altered to make food as simple or as fancy as you’d like. typically use eco-fi felt which is made of recycled plastic bottles. The steak sides templates included in this detailed tutorial: Felt Steak Sides Tutorial. Do not scale the file to fit, print as actual size. Get the steak tutorial here. I love Katrina’s Soakers! They are wonderfully breathable cloth diaper covers that work great a night-time and are easy to make, even for a beginner. I use them every night for my children and they wake up with dry clothes every morning. The pattern is available in several sizes and is FREE. It can be downloaded here. The original sewing instructions can be found here. 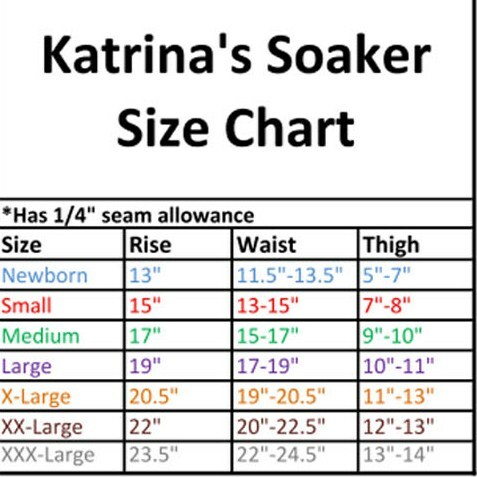 You can also use the tutorial I have created: Katrina’s Soakers. If you search the web, you’ll find tons of written and video tutorials for the pattern. They are really simple to make and very versatile. All of mine are made from fleece, but you can also make them from wool. If you are using fleece, make sure it is a 100% polyester fleece. Not all types of fleece are water-resistant, and no cotton fleece will be. I have had good success with JoAnn Fabric’s blizzard and anti-pill fleece although I have come across one or two prints that did not repel water well. Malden Mills Windpro Fleece will be the ‘cream of the crop’ and give you the best water resistance. 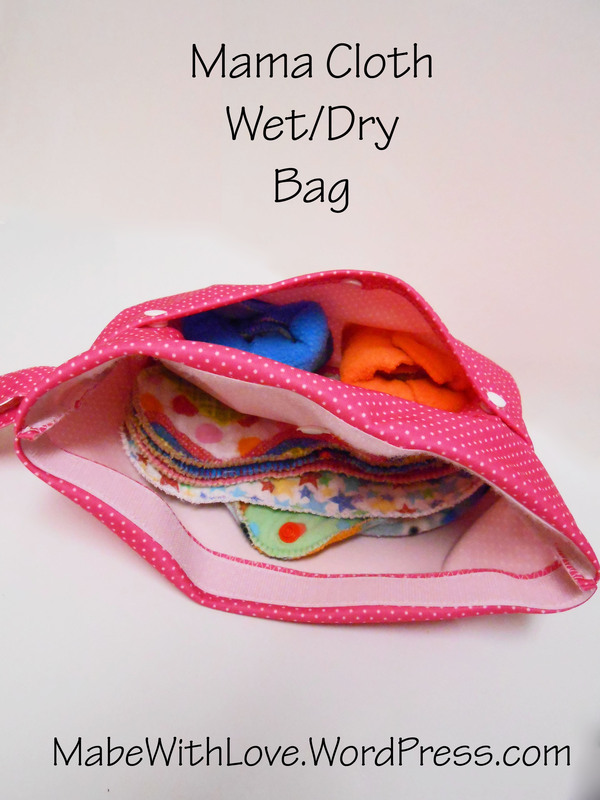 I always use the extra wet zone layer of fleece for added protection in the soakers I make for my children. To make a soaker, you will need the printed pattern pieces for the size you wish to make and water-resistant polyester fleece. You can use the tutorial noted above or, check out this one I created: Katrina’s Soakers. 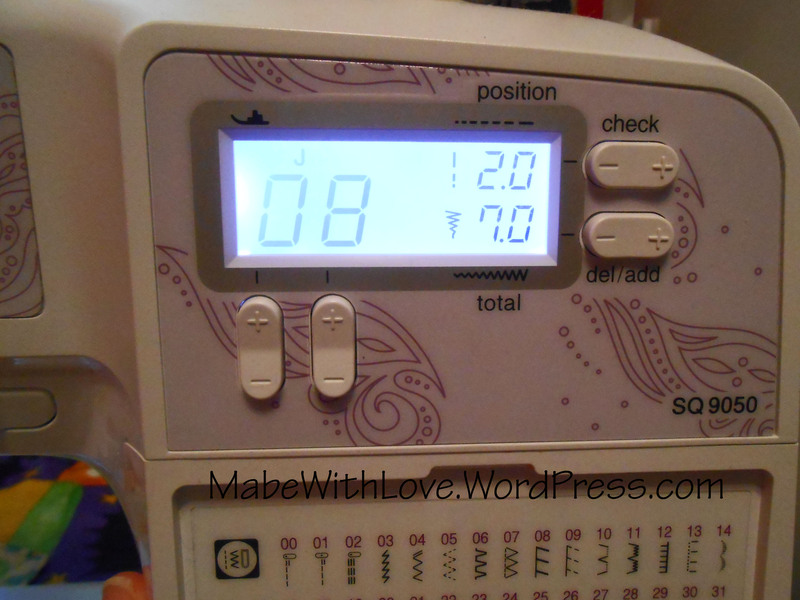 I sew mine on a regular sewing machine using a ball point needle, but you could also use a serger. in a fleece with little stretch. otherwise it won’t fit. You want to cut the soaker so that the body stretches across the waist, not up and down across the rise. The leg bands and waist band should be cut so that they stretch long ways, not across the short width. You want the pieces to stretch like this ——–, not up and down. Just give your fleece a little tug and see which way it stretches before you cut your pieces. It won’t really matter which direction the extra wet zone layer is cut. I normally just cut it from wherever I can maximize the use of my fabric. The back of the soaker is cut slightly higher than the front, to help cover those fluffy bums! Welcome! 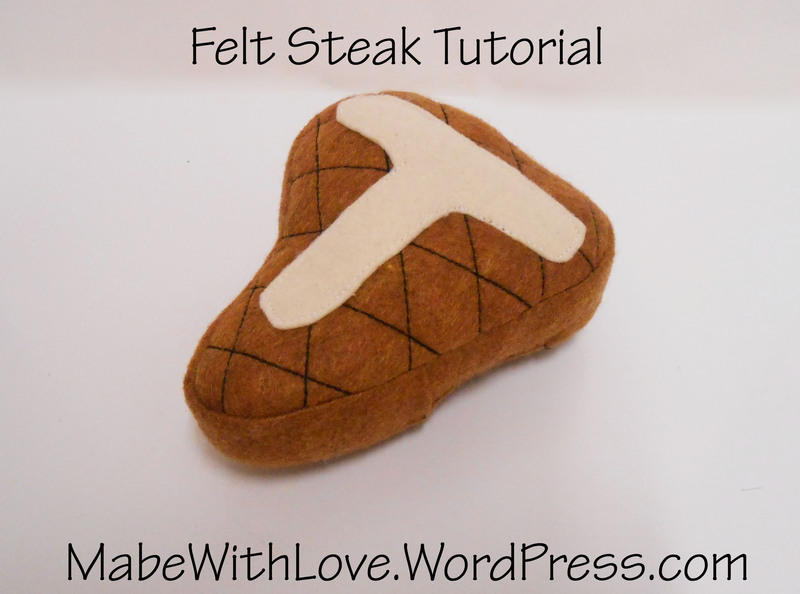 This is the first sewing tutorial in a two-part series where we will make a felt Steak Dinner set. Play food is a great beginner’s sewing project and can be altered to make food as simple or as fancy as you’d like. Grab the tutorial for your sides here! 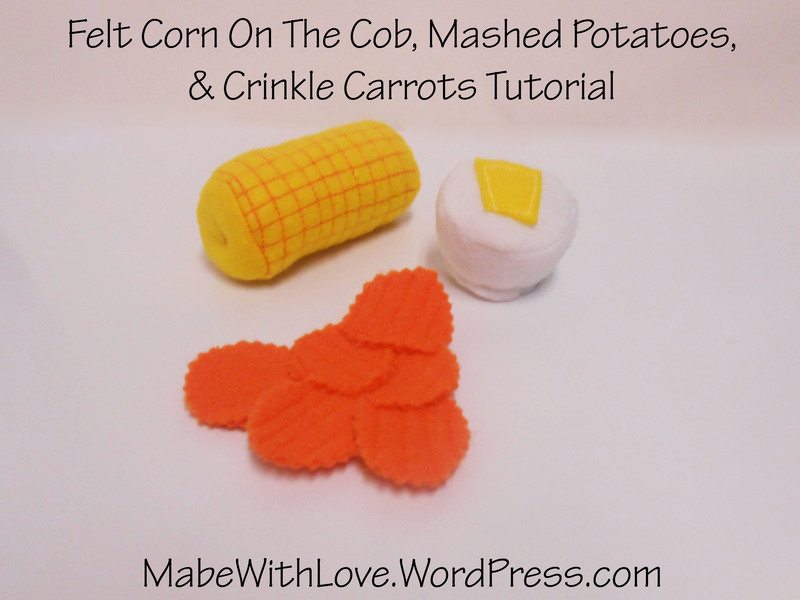 Yummy mashed potatoes, corn on the cob, and crinkle carrots!